Mirrors can be difficult to get right for accessibility. 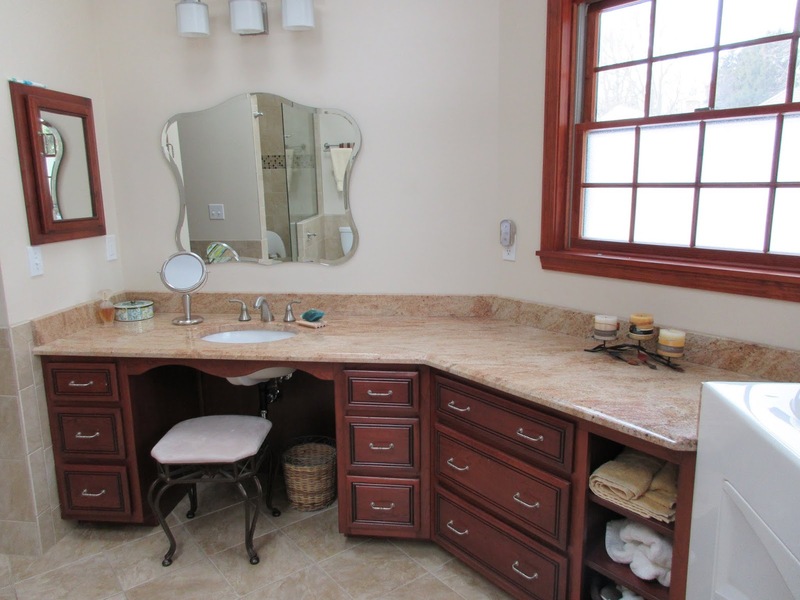 When designing a bathroom with a mirror or medicine cabinet for someone in a wheelchair it is somewhat simple and can be effective if you take a few details into consideration. Height from floor to eyes. This will assist in where to hang the mirror so the person will be able to see themselves. Height from floor to top of knees. This will allow you to know the clear space required for the knees to roll under the vanity. Most wheelchair seating is 21" above the finished floor and the knees are usually about 24" above the finished floor but that can vary. Width of wheelchair. Most adult wheelchairs are 28" wide but again that can vary. Forward reach. If the person has only limited reach or one arm then that needs to be taken into account when choosing fixtures and positioning the faucet at the sink. For instance you may need to mount the faucet to the side of the sink for reach limitations. When it's time to choose a mirror or a medicine cabinet there are some things to take into consideration. 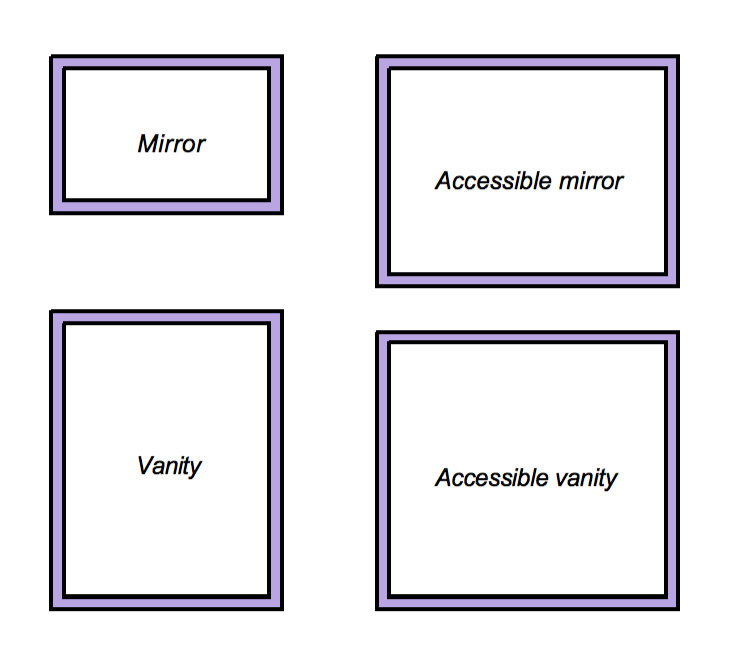 Choosing and hanging a mirror or medicine cabinet based on principles of universal design. Again universal design is designing for all users, not just average able-bodied people. Usually there is more than one person utilizing the bathroom. When choosing a mirror or medicine cabinet it is important the the mirror is long enough for someone to see themselves when they are in the wheelchair and when standing. 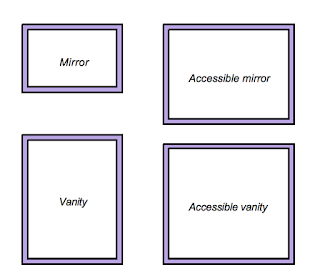 Below shows the typical configuration for a bathroom mirror and the configuration for an accessible mirror. Notice how the tops of both mirrors are at the same heights but the bottom of the accessible mirror is much lower than the typical mirror. This allows the wheelchair user to see themselves when at the sink. Mount the mirror just above the backsplash of the vanity, around 38"-40" above the finished floor. 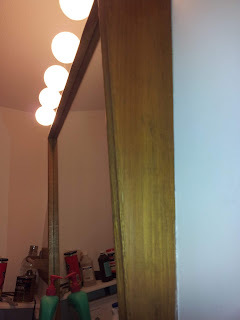 The top of the mirror should be about 5'10"-6' above the finished floor to be usable for most people in standing. It is always a good idea to take the heights of the people sharing the home into consideration when figuring mirror height. A mirror above a vanity should be a minimum of 34" tall to allow comfortable use for almost all users. Be careful when hanging a medicine cabinet for a wheelchair user above a sink. It's important to have the medicine cabinet mounted low enough for the users see themselves but high enough so it doesn't interfere with the use of the faucet. 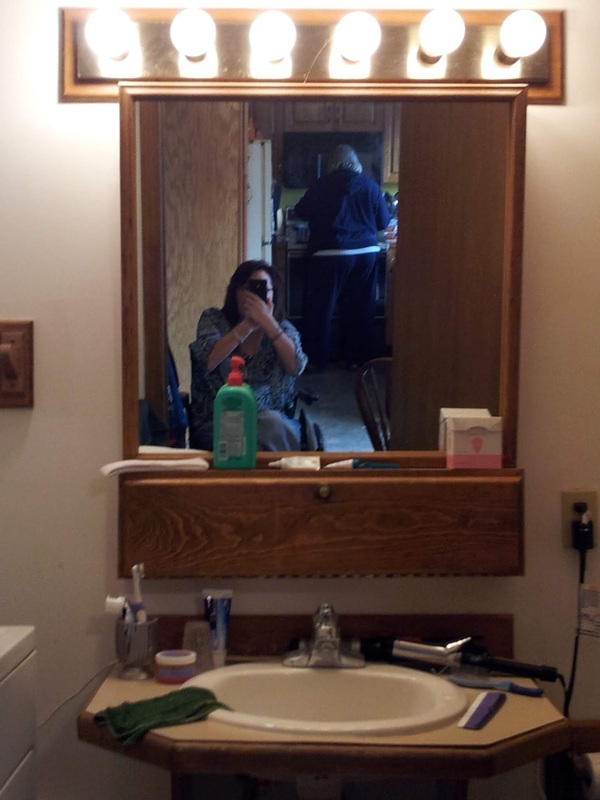 Shaving mirrors are a nice touch for wheelchair accessible bathrooms. Extra note: Mirrored medicine cabinets are almost unheard of, but below is an angled, mirrored, wheelchair accessible medicine cabinet that a man made for his daughter. The only one of it's kind as far as I know. The mirror itself is angled and fixed in place. Underneath is storage for the wheelchair user. The wheelchair user cannot see herself straight on but can look up to see herself and part of her body.